I can't believe another week has rolled by. Time goes too fast! I've spent most of my week at a writer's retreat with some of the most amazing ladies. I'm writing the sequel to Cozumel Escape this week. If you remember Brooks and Sydnee's story, I hope you'll love this one too. The hero, Jace, is the guy who chased Sydnee from Alabama to Cozumel. His heart was broken and he needs a feisty and fun lady. I'm very excited to announce that he's going to meet Moriah and her adorable boy, Turk, from The Faithful One at the Villa Del Palmar Resort in Cancun. Moriah is one of my favorite people with her positive attitude and dance moves. Trin and Zander forced her to go on this vacation, but she doesn't complain for a minute, especially when she meets Jace. My fun writing friends push me to write better and I love it. One of them is Rachelle Christensen. 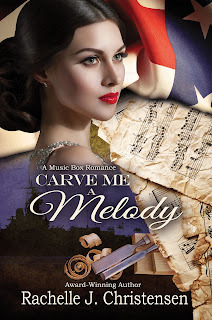 Carve Me a Melody is now available for pre-order. Isn't the cover gorgeous? To celebrate, Rachelle is hosting a giveaway for a $25 Amazon or Paypal Gift card. All you have to do for entries is join the party! Please join me in sharing the good news. Thank you for your support! Now a widow with two young children.